We were happy to accommodate her project needs. Call the Duke Company for all your construction equipment needs – including a wide variety of construction equipment rentals including the Ground Heater Rental – E3000 – by Wacker Neuson rental. Powerful Ground Thawing and Ground Heater Rentals in a range of sizes are available for rent in Upstate NY. 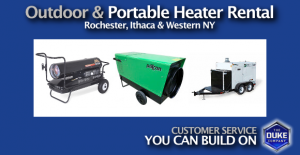 Call 585-292-9870 & 607-347-4455 for an accurate quote, professional grade heaters, best prices & fast delivery. 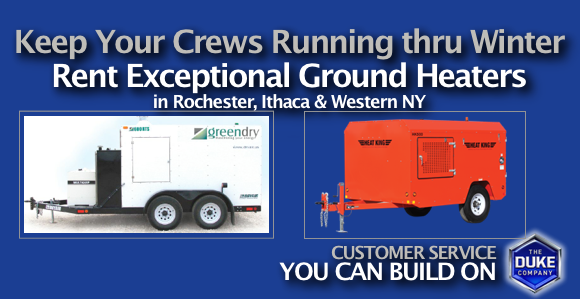 Renting round Thawing Heaters and Ground Heaters enables your crew to keep up and running during the Winter Season ahead. To effectively heat the ground, spread the heating coil loops through-out the surface area that needs to be heated (by example, the HeatKing HK500 can thaw up to 11,000 square feet of surface). On the hoses are evenly distributed, cover the hoses with heavy duty poly vapor barriers and insulating blankets. By doing so, heat is directed towards the ground. Ground Heaters work by heating propylene glycol, an environmentally friendly chemical, to approximately 180 degrees Fahrenheit. Glycol is pumped through the hoses, which rapidly heat up to one foot of frozen ground per day. 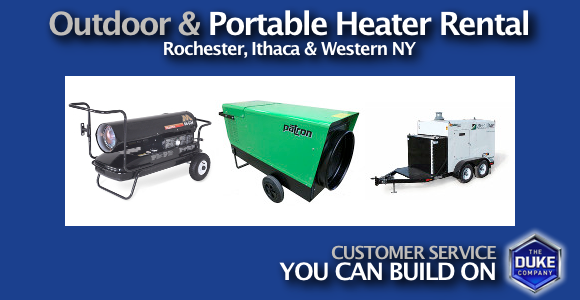 The Duke Company rents a range of outstanding ground thawing and ground heaters from Heat King and Wacker Neuson. Our expert Winter Heat team would be glad to assist you in determining which rental heater is best suited for your application. Ground Heaters are capable of quickly thawing ground from 2,8000 square feet to 11,200 square feet. Concrete Curing Capacity ranges from 5,600 square feet to 22,400 square feet.